1 Pair of Socks: $8.506-11 Pair: $8.25 ea.12 and up: $7.95 ea. FLAMING HEAT SOFTBALL SOCKS ... 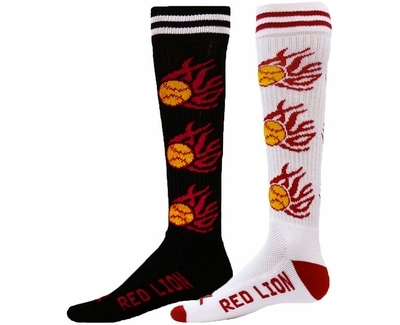 These Red Lion Brand Burning Red Hot Softball Over the Calf Socks are really On Fire! Softball Flame Embroidered Socks feature Sewn-in Yellow Softballs with Red Flames on both sides of the sock, and have a Sewn-in Heel construction with a Cushioned Sole and Foot which provide lots of comfort and durability. Flaming Softball Sock Material: 68% Acrylic, 21% Nylon, 7% Polyester & 4% Spandex. Care Instructions: Due to the sewing weave method of these Softball Flame socks - Hand Washing or Wash Separately on Delicate Cycle, and Tumble Dry Low is highly recommended. 2 Heat Flaming Softball Sock Colors: (shown above - Left to Right) � Black with Yellow Softballs, � White with Yellow Softballs. * * You can Mix & Match Colors & Sizes to get Quantity Prices! Red Hot Flaming Softball Knee-High Socks are fun to wear while playing Softball, or you can wear them for any leisure activity. . . so make sure to buy enough for the whole team, and all your friends. NOTE: We've done our best to show the true color of these Flaming Softball Socks, however since all monitor resolutions and brightness settings are different, these bright colors may look different on your computer screen. PLEASE call us if you have any questions about color-matching to uniforms, etc. Thank You. Quality product. Fits properly. Competitive pricing. Very fast service. Shipped same day of order. Arrived all the way to the Bay Area of California in two days with the standard shipping option. (Thanks USPS too!). Could be a little more crisp on design, but for the price excellent product. These socks are nice and thick and are excellent quality. I've been ordering softball socks for 10 years for my little league and these are by far the best! My previous experience with sock brands is that if I order the smaller size, they don't fit my 12 years olds. These socks are true to size, so if you have little peanuts on your team, definitely order the smaller size for them! Nice thick socks and they look good on the kids! Shipment was very quick and customer service was great at answering my questions. Great socks, our softball team will be wearing these this year! ProsGreat fabric, they're tall and soft! Girls really liked them, go Firebslls! I got these for my daughter. What caught my eye was the Red Lion in them. Their mascot is a lion, she loves them! The whole team loves these socks! Great socks. Just need larger size for those big kids.